Altitude : 800 metres (2,625 feet) above sea level. Matheran is a small, charming hill station located about 100 km east of the city of Mumbai, within the State of Maharashtra. Because of the high altitude, this hill station has a cooler and less humid climate throughout the year which makes it even more desirable to those who are looking for places where they can get rid of the busy city lifestyle especially during the hot summer months. This is one of the cleanest hills stations in the country with a completely pollution free environment. Located on a spur 803 m up in the Sahyadri ranges of the Western Ghats range, it's closeness to Mumbai and Pune ( 120 km) makes Matheran a popular hill station. Literally meaning jungle on top, this hill station was discovered by Hugh Poyntz Malet the then district collector of Thane in May 1850. But Matheran only became known when Lord Elphinstone, the Governor of Bombay built a bungalow, Elphinstone Lodge and introduced roadways in 1855. Thereafter, this hill station gradually became a popular tourist resort. Although a small hill station, it has 38 designated lookout points and the town, around 7.35-sq-km in area has a number of old colonial bungalows. Charlotte Lake, Panorama Point, Porcupine Point, Alexander Point, Echo Point, Hart Point, Khandala Point, Chowk Point, Coronation Point, Louisa Point, Monkey Point, Mount Barry, One Tree Hill and Shivaji's Ladder are some of the interesting names given to these stunning view spots. There is a toy train from the foothills, which is a 2 hour ride from Neral to Matheran. A ride in the toy train gives spectacular views of dense green forests, mist covered hills, valleys and rolling plateaus. Horses and Hand pulled Rikshaws are the main means of transport in Matheran. Also referred to as Sharlott Lake, this crystal clear lake is the main source of drinking water for Matheran. Situated in a picturesque valley it is a must-visit for all the tourists to Matheran. The famous Echo and Louisa Points are on the right side of the lake and Pisarnath Mandir lies to its left. The Mall of Matheran is the favorite destination for tourists extending from one end of the road to the other. The place has many hotels, restaurants and bazaars. The main market (Kapadia Market) in this area offers several items for purchase. One can hire ponies for sightseeing from this point. This is the main market in Matheran. It was built in April 1917 by Mr. P.N.Kapadia in memory of his wife. The market has many interesting shops and offers a variety of attractive items like cane and leather articles, hats, chappals, riding boots and food stuff such as popular sweet chikki made locally. Built in memory of Lord Nowroji, it is situated near the Kapadia Market. There is a fountain in the centre of the garden, erected in memory of Vithalrao Kotwal, who lost his life during the national movement in 1942. The garden is centrally situated and always well crowded. A radio is placed here for music-lovers. A path down to the valley from One Tree Hill point, which is a scenic spot, it offers picturesque views of the surrounding hills and is an ideal place for trekking. It is said that Chhatrapati Shivaji, the great Maratha ruler had used this path and hence the name Shivaji's ladder. It was discovered by Hugh Malet in 1850. This ground was prepared in 1923, by Mr. Sorabji L. Panday, in memory of his brother Mr. Fardunji Panday. Constructed in 1891, this is the biggest ground in Matheran and is famous for the Horse Riding Events held here. The Bombay Amateur Riders Club hold their annual mounted sports at Olympia over the last two weekends of May and the participation of professional horse riders from Mumbai and Pune make this event exhilarating. This historic park is a popular picnic spot in Matheran with different varieties of flowers and beautifully arranged benches. The statues of Mr. Malet, Lt.Col.Paymaster and Mr. S. L. Panday are erected here for their contribution to the place. This is one of the highest spots in Matheran which offers a breathtaking view of the Sahyadri and Neral village. Close to the Governor�s hill, it was named after Captain Barry. From here one can view the Central Railway line and the splendid view of the Matheran bound tiny train coming up the hill. Located 6 kms from the market, this is a must visit point in Matheran, which offers a panoramic view (that's why it's named as Panorama point) of the Sahyadri ranges. Famous for its view of the sunrise, it is also referred as the King of points. Between Panorama Point and Mount Barry, there is the Governor Hill, a big plateau. This is one of the best points of Matheran with its beautiful waterfalls. The waterfalls can be seen in the month of September and October soon after the monsoons. One of the hillocks on this point is called Lion�s Head. Deriving its name from the echo it provides, this point also offers picturesque views of the surroundings including waterfalls. All these spots are located near Charlotte Lake. One can see the Prabal fort and Louisa Point from here. It also presents a beautiful sunset scene. The heart shaped point offers a spectacular view of Mumbai at night and a view of the Matheran bound toy train coming up the hill. 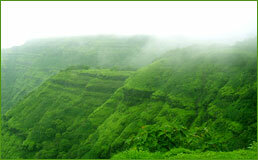 Situated 5 km from Matheran, it is famous for its views at sunrise and sunset. From here one can have view the Central Railway line as well as Bhivpuri and Khandala. It is situated near Harrison Spring. From this point one can see Garbut point and Khandala hills. The scene of the waterfalls during the rainy season is charming. It gives a good view of Garbut Point Chowk valley, Karjat, Chinchavli, Palasdari with its lake and the river Ulhas. It is situated near the Karsandas Library and offers a good view of Garbut point. The scene of the waterfalls in the rainy season, is absolutely mind-blowing. The point gives an excellent view of Garbut Point, Baimashankar, Khandala Point and Karjat Point. 2 km from Matheran, the point gives an excellent view of Garbut point, Khandala point, and Karjat point. It is another famous point situated near Paymaster Park. The point owes its name, to the monkeys abounding the area. The point is popular for its view of the Matheran railway. On a clear day you can see the city of Mumbai from here. A favourite spot for newly wedded couples. This point is named after the Coronation of Edward VII, King of England, on January 1st 1903. One of the best points of Matheran. It is in the vicinity of Porcupine point, Monkey Point, Panorama Point, Bawa Malang, Chanderi, Mhasmal and Sidhgad hills. From Rustomji point one can view the beautiful Landscape of Bombay harbor. Both are nearby and on the road of One Tree Hill. From these one can see Prabal fort and the flow of Dhavari river. This seat was built in 1939 in memory of the visit of the then Governor of Bombay, Sir Rojer Lumley. The point gives an excellent view of Echo point.